There was a time when the phrase ‘gaming laptop’ was something of a contradiction in terms. Back then, very few laptops could manage games more graphically demanding than Solitaire, and those that could run the titles of the day cost twice the price of their desktop counterparts. Today, things are different. There are a vast number of quality gaming laptops available that can not only match most home rigs but occasionally outperform them. Additionally, many companies now give buyers the freedom to pick and choose what goes inside their machines. If you’re thinking about going down this customizable route and want to know what components will give you a well-rounded gaming laptop, here’s a breakdown of what’s on offer. It should come as no surprise to learn that, as is the case with desktop PCs, when it comes to laptop gaming performance nothing is more important than the GPU. To give you an idea of how much laptop components have caught up to their desktop counterparts over the years, consider this: In 2010, Nvidia’s Fermi-based 480M GPU only offered 40 percent of the performance of its GTX 480 desktop equivalent. The gap narrowed to 60 percent with the 680M in 2012. Now, Nvidia states that the 980M is 70-80 percent as fast as its mighty GTX 980. Remember, this is a breakdown of components for the best all-round gaming laptop. If you want pure, ‘money no object,’ gaming performance that can (just) handle 4K then go for a laptop with two 980Ms in SLI. For a more balanced build, your best option would be to pick the laptop equivalent of the most popular desktop GPU you can find today – Nvidia’s GeForce 970M. With the 970M you’re getting 1280 CUDA cores, 80 Texture units, 48 ROPS and a base clock speed of 924 MHz. This translates as silky-smooth 1080p gaming on ultra settings and better than average 1440p performance with most games set to high quality. You may find that the 970M is available in 3GB and 6GB version. Benchmarking tests have consistently shown that having the extra 3GB makes little difference to gaming framerates, so don’t waste your money on the 6GB incarnation. If for some reason you're determined to go down the AMD route, the closest laptop GPU AMD has to compete with the 970M is its R9 M395X. The Radeon still lags behind Nvidia’s offering in most gaming benchmarks but most importantly, it's harder to get since it's not offered as widely. When it comes to choosing your laptop CPU, you’ll find that a large number of places now only provide Intel’s 6th-gen Skylake processors. There may be a few companies still offering previous gen chips, but the Skylakes will give you a longer battery life and better general performance – although you won’t notice much difference between the two generations when it comes to gaming. You’ll see a number of suffixes on laptop CPU models, but the two most common ones are U (Ultra-low power) and HQ (High-performance graphics Quad core). The main difference is that the HQ brands are quad-core CPUs, as opposed to the dual-core U processors, which means they’ll boost both your gaming and overall laptop performance. So, the best choice of CPU comes down to one of the Skylake i5HQs or i7HQs. While all of the i7s feature hyperthreading and most have faster clock speeds than the i5s, neither of these attributes make a massive difference in terms of gaming performance. Plus, the i7s are still quite a bit pricier than the i5s. However, an increasing number of games do recommend i7 CPUs these days, and the top-end chip will be helpful for other laptop tasks, so if you can afford it go for the Core i7-6700HQ. Assuming you pick a Skylake setup, you’re going to be using DDR4 RAM. The only thing you have to decide is 8GB or 16GB? Simply put, when it comes to gaming that extra 8GB of RAM makes little to no difference. In our RAM comparison tests, the FPS counts for Grand Theft Auto V, Batman: Arkham Knight and F1 2015 were either exactly the same or a mere one frame per second slower when comparing 8GB to 16GB. In fact, even the 4GB results were pretty much identical to the 16GB frame rates. Unless you're planning on doing some highly demanding processes outside of gaming, 8GB remains the sweet spot when it comes to system memory, for both laptops and desktops. Long gone are the days when the only storage decision you had to make was what size hard drive to pick. Today, laptop buyers need to decide not only how many MB/GB of space they’ll need, but what type of drive to opt for and how many. The common setup and the one that gives the best performance to price ratio is still the single SSD and single HDD combination. Most online stores that let you customize your laptop will offer super-fast M.2 drives that can reach eye-watering speeds of over 2GB/s sequential reads and up to 650 MB/s sequential writes. But, as you can imagine, this kind of hardware will increase the overall price of your build. There are even some top-end gaming laptops, such as MSI’s GT72S Dominator Pro G 29th Anniversary Edition, that come with two M.2, NVMe drives in RAID 0 (along with a 1 TB HDD), but that’s what you get when you spend several thousand dollars on a laptop. When picking what type of SSD you want in your machine it’s worth remembering that even though you may pay about 30 – 50 percent more for an M.2-based drive over a standard SSD, you’re unlikely to notice much difference between the two when it comes to gaming (assuming you’re playing a game that’s located on the SSD and not the HDD, obviously). Ultimately, the choice of whether to spend the extra money for faster boot and application loading times is down to the buyer. As for what capacities to pick, the 256GB SSD/1TB HDD is the most popular combination as it gives a good amount of space for the price. Actual screen size is always going to come down to personal choice. 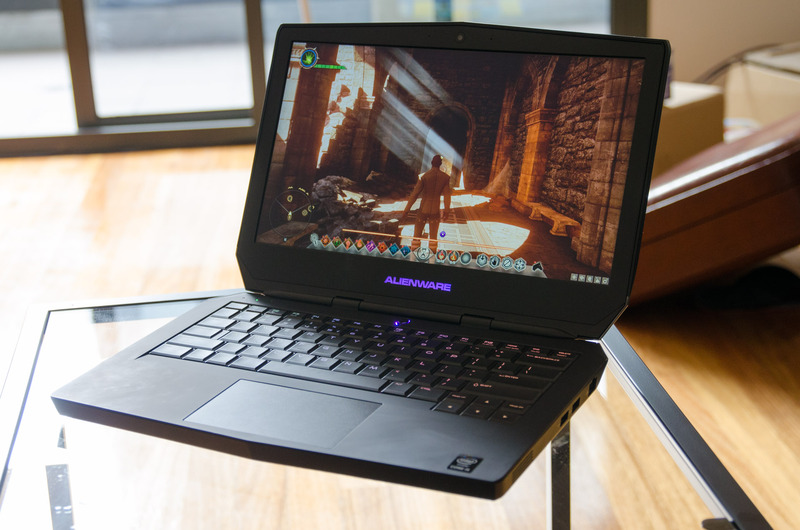 While some gamers do prefer sceens measuring 17.3-inches and above, which can make the laptop feel closer to a desktop monitor, it does mean reduced portability and a higher price. The other big question when it comes to screens is whether to opt for something above 1080p. The GPU processing requirements for 4K gaming on laptops still makes the resolution an unrealistic option for gamers, so you’ll be picking between 1920x1080 and 2560x1440. While 1440p gaming generally works well with a GeForce 970M, you may find a few titles will drop to around 30 fps with the settings pushed to Ultra. Moreover, you’re likely to be paying a fair bit extra for displays with resolutions higher than 1080p. But, as shown with the Gigabyte P34W v5, combining the 970M with a 1440p screen can produce around 45 - 50 fps on demanding games such as GTA V and Metro: Last Light with the graphics set to High quality. So investing in a 2560 x 1440 screen is a good option; a drop of 10 to 15 fps is a small price to pay when 1440p looks so good. A couple of other options to consider with your laptop screen are G-Sync and 75Hz or higher refresh rates. While these features are likely to push the price of a laptop a bit higher, they aren't cost prohibitive and will greatly improve your gaming experience. With G-Sync, games running or dipping in-game at 35-45 fps no longer feel choppy. Alas, there still aren't a lot of laptops supporting the technology, but if it's an option we'd say go for it. No laptop is going to give you a particularly long gaming session before it needs a charge. The Razer Blade Pro (960M), for example, packs a 70Wh battery but will play Crysis 3 on max settings with 100 percent brightness for only around 55 minutes. So you may want to check a laptop’s battery capacity before making a purchase. Something else to remember is that these gaming devices pack a lot of powerful hardware into a small space. In cases where a laptop’s cooling solution leave a lot to be desired, the base of the machine can become incredibly hot. So hot, in fact, that the term ‘laptop’ becomes a bit silly, as using them on your lap can feel like you’ve got a massive, burning iron on your legs. Optical drives are fairly redundant these days, but they’re usually pretty cheap to add to a laptop’s configuration. And a good keyboard and trackpad are obviously going to help, although most gamers will prefer to attach their own mouse to a laptop -- and in that case we recommend checking our guide for the best mice in the market right now.